One more week until Christmas! Are you ready? Our Christmas Stress Buster Mixes are flying out the door as are our Bush Flower Stress No More Essences! We have just made up more stock if you need some. Using some supportive and calming herbs like Skullcap, Passionflower, Siberian Ginseng and liver herbs like St Mary’s Thistle, Dandelion and Globe Artichoke plus the gentle Bush Flower Essences you are sure to feel supported, calm and in control. Plus you may beat any nasty hangovers with the liver mix! 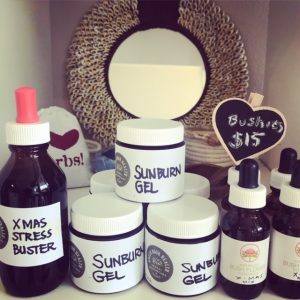 We have also made up some amazing Sunburn Gels with Aloe Vera, Maritime Pine and the Australian Bush Flower Essence Mulla Mulla which is amazing for any distress associated with exposure to heat and the sun. We have the full range of Australian Bush Flower Essences which we are very proud to offer you as they are based in our very own Northern Beaches. They work so well on not just on physical aspects but are wonderful for supporting our mental and emotional needs as well. I had some feedback from a patient that was not sure if we are the same or offering the same as we used to. I just wanted to assure you that we are! We are still offering Naturopathy, Nutrition, Herbal Medicine, AND we now offer Bioresonance and Herbal Medicine Consultations with Anita Wilson. But we no longer have bodywork including massage. Instead we refer right next door to the lovely Helen Bennet from Massage One Therapy. We also have a wonderful herbal dispensary and now stock more products to buy like essential oils, burners, teas, bone broths, books, body care, crystals and baskets. Basically all you need for Christmas gifts! As a very special Christmas Gift to all my valuable patients I would like to offer all current patients 50% off all consultations this week and for the first week back in 7-12th January! Thank you for all your support this year and hope to see you next year!